The United States was roaring to bring its third successive resolution against Sri Lanka as in many years at next month's United Nations Human Rights Council sessions in Geneva. Though the US allies thought that it would be another cakewalk for the Washington regime at the world human rights body. 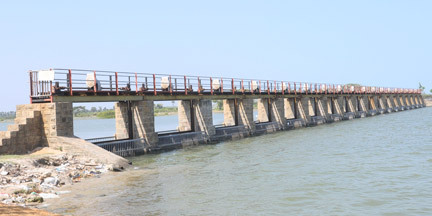 The reconstructed Thondamanaru sluice gates in Jaffna. But the latest developments have indicated that it is not going to be that easy for the US as in the two previous occasions. More are more countries have now realised that the true ground situation in Sri Lanka is far from what some of the anti-Sri Lankan elements have been projecting. Hence, all the member countries are not going to believe what the US-led Resolution says as the Gospel truth. You can't fool the international community all the time and more countries are now getting a true picture on Sri Lanka and the sincere efforts made by the Government to strengthen ethnic harmony. The conduct of the UNHRC and its chief Navi Pillay in recent times has been highly controversial. They have been treating Sri Lanka on par with a ruthless terrorist organisation, totally ignoring the human rights violations of 21 million people for nearly three decades. Moreover, the UNHRC should not show extraordinary concern about the human rights of the LTTE terrorists killed in action above Tamil civilians who had been forcibly held by the Tigers as a human shield. They should also bear in mind that Sri Lanka is governed by a democratically elected Government. People across the country in no uncertain terms have reposed implicit faith on President Mahinda Rajapaksa and the UPFA-led Government. The Government has been holding elections even before their due periods, allowing the masses to exercise their democratic right more often. Hence, the UNHRC or any other world body for that matter, cannot dictate terms to an elected Government in which the masses have reposed implicit faith. More and more countries are now rallying behind Sri Lanka against the international conspiracies hatched in the West. The Australian Government has categorically stated that it would not support any international investigation or sanctions against Sri Lanka. China and Russia too have sent a string warning that they would strongly rally behind Sri Lanka. Hence, it appears that the godfathers of the latest Resolution against Sri Lanka have gone back foot, much to the disliking of the LTTE rump. The United Nations now says that it is up to different member states to determine whether there will be an international process on alleged war crimes against Sri Lanka. "Ultimately, it's up to different Member States to determine whether there will be an international process. We have presented information to them and we've made clear what we believe is the need for accountability and we rely on the Member States' judgment to follow through," , the Acting Deputy Spokesperson for the United Nations Secretary-General, Farhan Haq was quoted as saying. 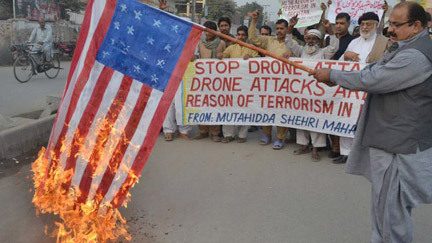 A protest in Pakistan against American drone attacks. He said "We've made it clear that there needs to be more done to get at the heart of what happened in Sri Lanka. You've seen what the Secretary-General's reports on the situation have said and it's clear that there continues to be a need for all the facts to be learned and for there to be a study of whether there's any wrongdoing that's occurred in the course of the final phases of the Sri Lankan conflict. The Secretary-General has said that repeatedly and we continue to hold by that," he had said. There wasn't a single godfather of human rights when we were badly affected by terrorism. Nobody came to our rescue, other than a few friendly countries. Those who now shed buckets of crocodile tear were at a faster sleep when we suffered untold hardships due to terrorism, without knowing when the next LTTE bomb would explode. Did any of those godfathers of human rights or champions of transparency come forward to protect us? None of them came forward to give the freedom to the people of the North that they enjoy today. When their human rights were violated there was nobody to restore them. Only we were concerned about it. It was our own leaders who protected us and established peace by vanquishing the LTTE. Nobody raised the issue of human rights when the former opposition leader T. Amirthalingam, Sam Thambimuttu, Minister Lakshman Kadirgamar, Kumar Ponnambalam and Rajiv Gandhi of India were assassinated. Prior to May 2009, every family in the North and the East had to sacrifice the future of a family member to foster the LTTE - to a provide a member to the LTTE. Thousands of children of school going age were forcefully recruited to the LTTE. The children returning home from school were forcefully dragged away to the LTTE training camps. The TNA politicians who now project themselves as the saviours of Tamils turned a blind eye. The LTTE grabbed the subsidies sent from the South to the North. LTTE even levied a tax on celebrations held for a girl's attainment of age. The entire family was not allowed to leave Kilinochchi together for any purpose. The Tiger agents were near Government Agents offices to grab their share of money from monthly salary of Government servants. They also forcibly used Northern civilians to build bunkers. Where were those TNA politicians then? Why didn't they utter a word of comfort when their own community was at the receiving end due to LTTE threats? Now that the Government has vanquished the LTTE leadership and established peace, TNA politicians are projecting themselves as instant heroes, making a big hue and try over the rights of the Tamils. But it was President Rajapaksa who has really been instrumental in liberating half a million people who has been forcibly held as a human shield. Why doesn't the West talk on any of these gigantic achievements? The US Assistant Secretary of State for South and Central Asian Affairs Nisha Desai Biswal who toured here recently had assured the Government that the US does not have a set agenda against Sri Lanka, but it is compelled to take up certain issues due to the values upon which the US has been founded upon. At a meeting with the Minister of External Affairs, Prof. G.L. Peiris in Colombo recently, Biswal had said that there is "growing frustration" in the international community due to the fear that Sri Lanka will lose the golden opportunity provided by the end of the battle against terrorism. But neither Biswal nor her US Government should worry about that. The peace that one and all enjoy today did not come in a platter. The US did precious little towards that goal. It was virtually the lone battle of Sri Lanka, under the political sagacity of President Rajapaksa, which enabled us to enjoy this hard-earned peace. Neither the US nor any of the Western country should teach us about values. Sri Lanka's rich history of over 2,500 years provides ample testimony that the people of Sri Lanka have always respected humanity and protected age old customs and values. It was the Western nations -- the Portuguese, the Dutch and the British, who invaded our country from 1505 and killed thousands of civilians and robbed the wealth of our country. If the UK has an iota of shame, it should first hold a credible investigation on the numerous human rights violations by the British forces which had invaded after the Dutch. Those who have loads of garbage in their backyards should not act as saints and preach Sri Lanka on transparency and accountability. It is an open secret that the US forces have committed a wide range of war crimes - in various war situations in which they've been engaged throughout history. Most - but not all - contemporary war crimes are defined by the International Criminal Court (ICC), the Geneva Conventions and the associated laws of war under the International Law. War crimes can be prosecuted through the War Crimes Act of 1996 in the United States but the US Government does not accept the jurisdiction of the ICC over its military forces. But the self same people are now pointing an accusing finger at Sri Lanka's valiant Security Forces which had been engaged in the world's largest human rescue mission. No country could level war crimes charges against Sri Lanka as its Security Forces battles with the most ruthless terrorist group in the world which had mercilessly killed thousands of civilians. Could anyone with right sense could call it a war crime? All these allegations are levelled due to one reason - that Sri Lanka has a leadership which does not dance to the melody of the West. Unlike the previous UNP regimes, if the present Government too had acted to the whims and fancies of the powerful nations of the West, none of these resolutions against Sri Lanka would have come up at the UNHRC. All Sri Lankans should be proud of our fearless foreign policy and the dynamic leadership which only cares for the wishes of the masses and not the Western politicians. While thanking the friendly countries for the continues support they have been extending since the difficult periods, all Sri Lankans should forget the petty party politics to beat the common enemy. If we are united, no force on earth could challenge Sri Lanka's sovereignty and territorial integrity. We are fortunate to have a leadership that would always put country before self and would never allow any extraneous force to rob the hard-earned peace.